An interesting novel. I decided to read it based on a recommendation from someone in an online book group. They said it was remarkably well written, especially in how he developed his characters. It was pretty good in that sense, but throughout most of the book I found the characters to be less than believable. They didn't mention the novel's central device, though, which is that it's written in reverse. 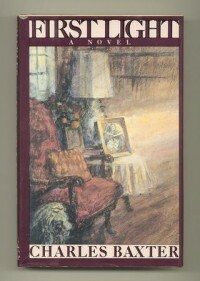 It begins at the death of the main character (Hugh), and moves backwards in time, chapter by chapter, until he is a toddler at the birth of his sister (Dorsey). This is tied pretty closely with the Big Bang/Big Crunch theory of the universe (Dorsey is an astrophysicist), and in that sense it works quite well. That, actually, became the most interesting aspect of the novel for me. As I said, the characters themselves were often not that believable. But there was something compelling about them. Their relationships were interesting at times, and it was interesting to speculate on what would "happen next"—that is, on what had happened to bring them to this point. But I have such a bad memory that I ended up forgetting details I wanted to remember, which would probably have made it a much more interesting book for me.